Smith Brothers is excited to announce the addition of Ashley Sieniawski, Carly McLeod, Beth Anderson, and Lindsay Motta! Joining the agency as a Producer, Ashley Sieniawski brings a variety of experience in project management from both the client and agency perspective. Ashley has worked with clients like The Girl Scouts of Western Pennsylvania, TransMotion Medical, and Destination Erie. She was also once employed as an ice cream truck driver! An Ohio native, Ashley is a graduate of Gannon University with a BS in Advertising Communications. A content creator with eight years of experience, Carly McLeod comes to SBA as a Content Coordinator bringing client projects to live on time and on budget. Experienced across several categories, Carly worked on a variety of clients like Dollar Bank, UPMC, PPG, VisitPittsburgh, Slippery Rock University, The Pittsburgh Film Office, Straub Brewery, and Pittsburgh Symphony Orchestra. 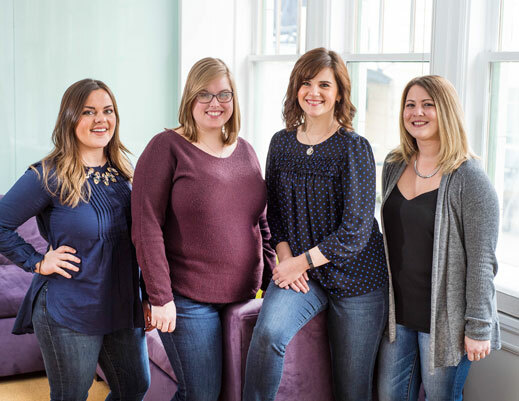 A graduate of Indiana University of Pennsylvania, Carly founded the Levo League chapter of Pittsburgh to help empower Gen Y women through networking events and workshops. In her spare time she plays the flourishing tenor drum in competition bagpipe bands. With more than 12 years of experience in production art, Beth Anderson joins SBA as a Senior Production Artist. Beth has organized and managed large complex projects efficiently, such as segmented/variable direct mail projects for Rite Aid. Beth can handle production for both Print and Interactive mediums, including brochures, direct mail, point-of-sale, out-of-home, magazine/newspaper, as well as web banners and emails. Beth spent 13 years at MARC USA working with clients like Rite Aid, PA Lottery, Mohawk Flooring, Moen Faucets, Bryant/Carrier and The Warhol Museum. A graduate of the Pittsburgh Technical Institute, Beth and her husband John have two energetic sons. Lindsay Motta joins SBA as a Senior Social Media and PR Strategist. A Pittsburgh native, Lindsay comes to Smith Brothers from VaynerMedia in New York City, where she led insight-driven, integrated marketing campaigns with a social focus on behalf of several clients, including Sour Patch Kids and HALLS Cough Drops. Highlights of her career include: planning a real-time, hyper-targeted paid Facebook campaign using sickness-tracking data to drive purchase intent for HALLS, launching the first Mondelez brand on Snapchat, and executing an influencer marketing program live from the Teen Choice 2015 Red Carpet. Lindsay holds a M.S. in Communications from Columbia University, and a B.A. in Journalism, Advertising, and Public Relations from Duquesne University.